It's not a light texture due to shea butter as one of main ingredients but I have no problems to nicely massage it into my eye skin. It absorbs quickly and results are there. Thank you for great product with plenty of useful ingredients. I was worried after reading the reviews of the texture of the cream, but I don’t know if something has changed or not , but I have 0 problems with the creams texture. I have combination skin and the cream for me absorbs really really quickly. Can’t say about the results as I generally don’t notice much difference, but my very sensitive skin tolerates it well and the cream leaves my under-eye area soft and moistured. I bought it out of curiosity to use during the winter. My skin is mostly oily (without acne or inflammation - just thick and oily) but sometimes it is dehydrated due to frequent air travel, and I do have few mimic lines around eyes but when my skin is well-hydrated they are not noticeable. However, I felt like giving extra care to my eye area skin sometimes. So, I bought this cream when Paula's Choice has just released it. I will not be the first reviewer to mention that the texture of this cream is worse than DIY shea butter moisturizer. It doesn't get absorbed for few hours (and I squeeze out maximum a beluga lentil size amount). It does make the skin look and feel softer and smoother right after the application but since it doesn't get fully absorbed and creates a greasy film on the skin, I feel more irritated than happy with the result. It is only suitable as a night time cream and for EXTREMELY dry skin. My biggest complain (and the main reason why I will never buy it again and won't recommend it to anyone) is that after around 5-7 days of daily use it started to sting and irritate my lids. I have same issue with creams containing retinol A. Yet this one is not claimed as containing one. I don't know what ingredient it is but there is something in this cream that literary "dissolves" my skin and causing burning and stinging sensation. I stopped using it and after a while tried again. I noticed the issue doesn't happens with the initial application - it worsens the longer I use it and it is not allergy - it is developing sensitivity to one or few ingredients of this cream. It needless to mention that I stopped using it and now curious if I can use it as cuticle cream or just throw it away? NE - Hydrating but non absorbing. I have been using Paulas Choice products for the past year or so. I have really combination skin with a very dry eye area. I use the resist lotion but while I found that this was perfect for my face, it was not hydrating enough for my eye are. So therefore, I decided to try the eye cream. I ordered a sample online. I put about half a pea size amount of cream on one of my fingers and warmed the product up between my fingers for about a second. Then I proceeded to pat it on my under eye area and around my orbital bone. Initially, I really liked the product as it was doing the job of hydrating my eye area. However, it does not absorb properly of which this is a downfall. I found that the cream left a sticky residue on my eye area and was still there this morning. I washed it off and yes it did hydrate my eye area but nothing more. I dont think this cream would be suitable under make up because it does not absorb properly. In my opinion, this could only really be used as a night time eye cream which would mean using a lighter cream for the daytime. This would work out really expensive. Also, I think this eye cream is very expensive for what it does and what you get in the tube. I will definitely be purchasing PC products again but not this eye cream. Therefore, that is why I only give this product 3 stars. Right after I turned 30, I started to notice crepiness under my eyes and dark circles. I tried a few things that unfortunately did not work, but either only irritated or dried my under eyes more! I had already been using Paula's Choice products, and I was super duper in love with the quality and results! Then I decided to purchase the Resist Anti-Aging Eye Cream! When I received the product, I thought this is tiny I'm going to go through this in a week! To my surprise it lasted me more than 3 months! I use it daily: morning and night! I noticed that you need to be consistent to see the positive effects and results! I can't do with out it now, it's a part of my skin care morning and night routine! This eye cream is my Holy Grail! I can not live without it now! I'm already on my second tube! It is so well developed the formula that you will notice the difference! I'd never used an eye cream before, as I never felt the need for one. All my other creams worked just fine for that area. I decided to try this cream just because it sounded intriguing. I've been using it for about a week now and so far I like it. I don't think it's too thick, I just squeeze a small amount on the palm of my hand then sort of blend it with my finger. I apply a few drops of the Antioxidant serum around my eyes first and let it absorb for a few minutes then I apply the cream. I don't have to tug on my skin or anything like that, it just mixes really well with the serum and absorbs nicely after a little while. Leaves a non greasy layer that I like and stays put till morning, when I can still feel some remnants of the cream around my eyes. The cream doesn't travel anywhere and doesn't get into my eyes. It seems the skin around my eyes feels more hydrated and a bit better under makeup, but it's too soon to tell about any other effects. I do have dark undereye circles which I got after three years of not sleeping well nor enough hours, and if it helps with that I'll be really glad! Only reason for giving it 4 instead of 5 stars is the tiny tube which I wish was 30 ml instead of 15 ml for the price. I have been using this for about 3 months now and it is moisturising and non-irritant. However, I wish there was a brightening agent in this formula. I have dark circles and I end up using color corrector. Please add that to the formula!!!!! I have been using this eye cream for a good 6 weeks, so I am now able to review it properly. I really like, it moisturizes really well, but I find it too rich to wear under makeup. I wear it at night time or when I am not wearing makeup at all. Problem solved. Nevertheless, this means that I have to have two eye creams instead of just one. Hence, the 4-star rating. This is the first Paula's product that has really disappointed me. It is so hard to spread that it seems to have dried out. I wondered at first if my tube had been on the shelf too long. I expected a more rich and easily absorbed cream. It can't be good to pull at the skin around the eyes just to put the cream on. Even then it hardly absorbs. I cannot say I have noticed any benefits after three weeks. I am a big Paula's fan and have used her products exclusively for many years. What a pity this product is not as good as the others. Customer Care: Thank you for your feedback. We are sorry to hear that this product did not work as expercted for you. It may help to first slightly rub it between your fingers before applying it which might help it spread better. Otherwise, please contact our customer care department for further assistance. I had been waiting for this cream to be available in Europe for months. One of my main concerns is the extremely dry and, therefore, extremely delicate skin around my eyes. I was really looking forward to PC’s eye cream. But the “richness” of this product seams to rely on its extremely heavy texture. I find it impossible to use. The application is a nightmare. The tugging and pulling at one’s skin required to properly apply this cream is going to be so damaging that it completely defies the purpose of any beneficial ingredient. No wonder PC emphasises the fact that this eye cream stays “on your skin until the next morning”. It seems to do so by just laying heavily on top of it without getting absorbed. The texture of this “cream” feels more like a pomade or a lip balm given the unbelievable amount of shea butter. I have been trying to make this work by mixing it with the oil booster but it just makes it worse. The texture of this cream is incomprehensible to me. If a brand decides to go against its own philosophy by creating an eye cream, then it better make it worth it. This is an epic fail. Please do something about the texture of this “cream”. Customer Care: Hello, and thank you for sharing your experience with us - we're sorry to hear this didn't work as expected for you! Please contact a member of our Customer Care team for further assistance in finding an alternative. Daba - Great eye cream but the PRICE!!! 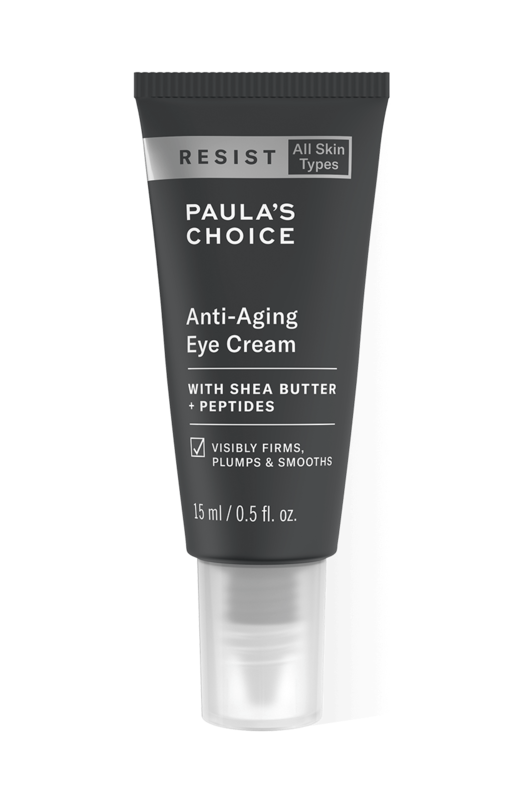 I have used Paula's Choice products for over 15 years, and one issue on which I always disagreed with her was about eye creams. The skin around the eye *is* different than the skin on other areas of the face: it can be dry even if you have very oily skin, it is thin and delicate, and it is most often the first place where signs of ageing appear. I saw Paula's video when she finally introduced her own eye cream and I respect her admission and recognition that after all these years, many people do, in fact, need a special eye cream. What I am FLABBERGASTED about is the PRICE! One of Paula's pet peeves, especially about eye creams, always has been the fact that you pay so much more for a much smaller amount. And behold: Paula's eye cream costs $32 for 0.5 oz (i.e. $64 an ounce). By comparison: the Clinical Ultra Rich Moisturiser costs $30 for 2 oz (i.e. $15 an ounce), the Resist Intensive Repair Cream and the Resists Barrier Repair creams both cost $32 for 1.7 oz (i.e. $18.82 an ounce) and the Moisture Boost and Skin Recovery Replenishing moisturisers costs $28 for 2 oz (i.e. $14 an ounce). On average that means that Paula's new eye cream costs ***FOUR*** times more than the majority of her other moisturisers. Even her serums (arguably more expensive products to produce) cost $32 for 1 oz (i.e. TWICE the price of the eye cream), effectively negating the argument that the eye cream is THAT much more expensive to produce (its primary ingredient, shea butter, can be bought in large tubs at the drug store for a few dollars and it can't have THAT many more effective ingredients than her other moisturisers and, especially, her serums). I have bought Paula's eye cream and am happy to say that I have found it to be just as good as some of the best eye creams I have tried and used in the past. But Paula owes us, her loyal clients, an explanation for what she herself previously, for two decades, called an 'outrageous' price and an obvious and unequivocal means of making extra money by packaging an eye cream product in such a small packaging and charging the same price as that of a similar products packaged in twice or even four times larger quantities. I think she also owes an apology to all the fine brands that have offered such products for years -- well formulated and packaged -- that she has LAMBASTED for their audacity. And I call on her, as a loyal customer, to lower the price of this product or provide a larger quantity for the same price. I remain a devoted customer of Paula's Choice. I have used her products for many years and (if I may say so myself) I look fantastic for my age. I respect and appreciate her admission that she was wrong. But her slavishly copying the commercial racket of charging such an inflated price for an eye cream has disappointed me greatly and has made me suspicious of whether she is still true to her original goal: to make the finest, most effective products available and *realistic* prices. If I am wrong and there genuinely is a reason why this product is so much more expensive than comparable products in both her and other companies' lines, I would be very happy to hear it. I too would be more than willing to admit my mistake if I am wrong. Customer Care: Thank you for your review: Paula herself was happy to reply to your review: "Pricing products is not easy for us. On the one hand we want to always have affordable prices but on the other we also always want to use the best ingredients possible and especially with new research for specific concerns it often becomes far more expensive for us to create. This is particularly true for our eye cream. What it cost us to formulate this product over three years (we worked on this product longer than almost any other we’ve formulated) and to find the best ingredients we felt would improve the skin around the entire eye area was significant." 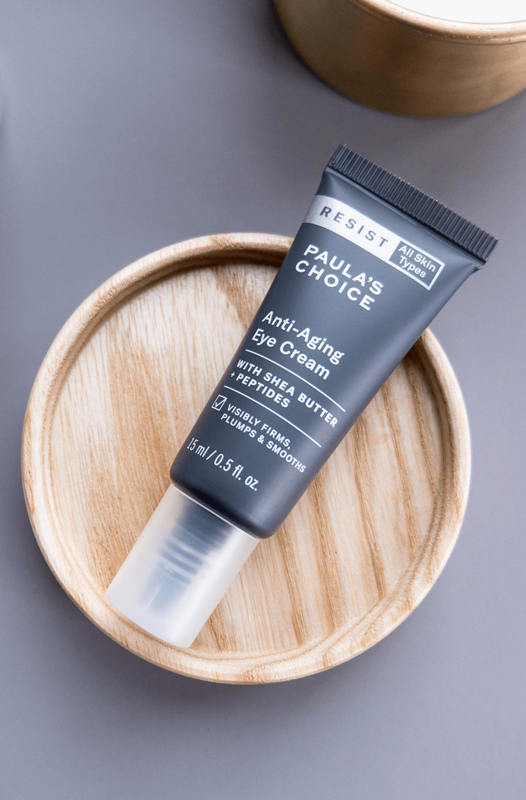 Paula has and still maintains that you don’t necessarily need a special product labeled “eye cream” but you may need a richer or different moisturizer if the skin around your eyes is drier than the rest of your face and that’s why she developed our new RESIST Anti-Aging Eye Cream. And when Paula and her team have criticized other brands for their eye creams, it’s almost always because they’re packaged in a jar or their formulas differ little from the “partner” facial moisturizer or they contain problematic ingredients for the eye area, price is the last consideration and only an issue if the product is poorly formulated. We love that our customers do comparison shopping and if they feel another product will work better for them at a better price that is great but if they compared the detail of all the combined ingredients and not just one or two along with the stability of our formula we believe ours would come out way ahead.